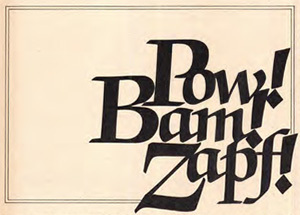 This dramatic treatment by Herb Lubalin (U&lc, June 1979) shows the dynamism of ITC Zapf Chancery. The ITC Zapf Chancery® typeface has been seen by just about everyone who uses a personal computer. In particular, one member of the family – Medium Italic – has been selected (or not) by millions of designers and non-designers alike. 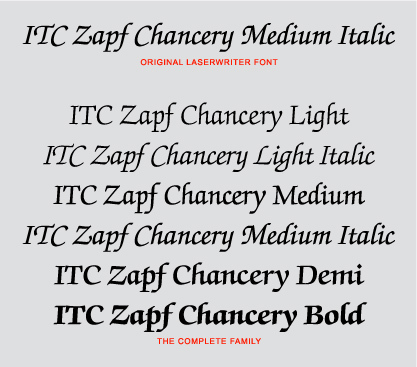 In the mid-’80s, ITC Zapf Chancery Medium Italic was chosen as one of the original Apple LaserWriter core font set. Years later, it became part of both the Mac and Windows OS. It has become one of the most commonly used – and one of the most widely misused – typefaces of our day. What’s the story behind this typeface designed by Hermann Zapf, one of the most well-known and respected contemporary typeface designers? Allan Haley, Director of Words and Letters for Monotype Imaging, was Director of Marketing for International Typeface Corporation (ITC) when ITC Zapf Chancery was licensed to Apple. I asked him to jog his memory and tell us how it came to pass. Q. When did Zapf Chancery become part of the ITC library? A. ITC Zapf Chancery was announced in the June 1979 issue of U&lc, ITC’s tabloid quarterly publication. It was a pretty special announcement in that Herb Lubalin, who was the journal’s designer at the time, created an eight-page feature showing how the typeface could be used in various applications, from book covers to stationery to packaging. Hermann Zapf had designed four weights, two of them with an italic counterpart, and Lubalin showcased all six. Q. How did it get selected as an Apple Mac system font? A. ITC had been trying to market a suite of our typefaces to printer and computer manufacturers for a couple of years – but hadn’t made much headway. Then, the company heard that Adobe was pitching several typefaces to Apple to become part of the LaserWriter® printer font offering. Aaron Burns, president of ITC, learned that Steve Jobs, then CEO of Apple, would ultimately decide which typefaces were selected. Burns reached out to Jobs in a letter, expressing ITC’s desire to help in the decision-making process. As it turned out, Jobs didn’t need much help. Q. Why was this one particular weight – Medium Italic – chosen by Apple? 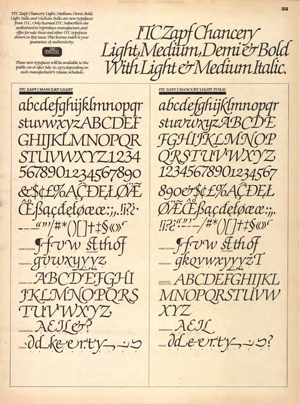 Lubalin presented roman and italic versions side-by-side. A. Because that was the typeface that Steve Jobs liked. It was pretty much that simple. While not a typographer, Jobs appreciated the value of typographic communication and had a more than fair understanding of type and typography. Zapf Chancery was the only calligraphy-inspired typeface he selected. Q. Zapf Chancery seems vulnerable to misuse by untrained users. Do you have any thoughts about that? A. ITC has always been dedicated to educating type users. The first time ITC Zapf Chancery appeared “in public,” Herb Lubalin showed it set properly. Yet, from the very beginning, some graphic communicators have insisted on using it to set all-cap headlines. Others persist in peppering blocks of text with way too many alternate swash letters. Any typeface is susceptible to inappropriate use, but scripts and calligraphic designs are more “likely victims” than more conventional designs. Q. Where can someone license the entire Zapf Chancery family?